Letters to Elijah: Should we Celebrate Christmas? Christmas has become so far removed from Christ that it makes me wonder how should we celebrate it - or should we even celebrate it? I know what you ar e thinking - of course we should celebrate Christmas! But should we? I know this post will go against the grain for a lot of Christians. I believe we should always go to our bible when we have questions of how to live our lives. I believe God's written word provides us with everything we need to live a life that glorifies Him and allows us to enjoy Him forever. My question is: Where in the bible does it tell us to celebrate the birth of Jesus? There is no mention in the bible to celebrate His birth. (correct me if I'm wrong here) However there is mention in the bible to celebrate his death. Jesus says in Luke 22:19b This is my body given for you; do this in remembrance of me. Jesus requires us to celebrate what He did for us - dying on the cross. We do this during The Lords Supper. So the bible does not answer me - How should I celebrate the birth of Jesus Christ - or should I at all? I'm pretty sure the Lord doesn't want me to study the toy wish book from various retailers. I know he doesn't want me to go into debt buying the latest toys for my children, but does He not desire praise from us for the wonderful awesome gift of His Son? Does He want us to celebrate Christmas? This is an interesting question. I'm thinking that maybe the 3 Wise Men traveling all that way to see Jesus could be considered a celebration. They even gave gifts! I have to say that I really don't like how commercialized Christmas is. I refuse to get all worked up about the shopping and decorating and stuff. Oh, I think God wants us to celebrate His Son's birth, but He wants us to celebrate always remembering the cross. There are ways to celebrate his death through Christmas...we hang a nail on our Christmas tree, and I've seen crowns of thorns to put on the top of the tree instead of a star. Perhaps taking Santa Claus out of the picture and celebrating St. Nicholas day would be for you. Don't abandon Christmas, though...without Christmas, there would have been no Easter! Most of our holiday's come have deep pagan roots. 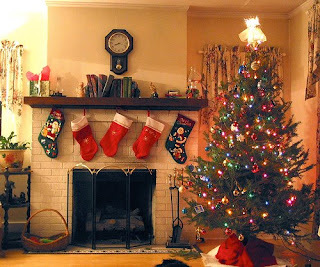 I heard a while back that Christians should not bring a tree into their home and decorate it. Doing a quick search for "Should Christians celebrate Christmas?" pulled up a lot of information on this topic. The problem I have, is that I know my family is not celebrating the pagan rituals, but in the back of my head I know that they are there. Jesus was also born in the spring, which also makes sense when seeing how the holiday has little to nothing to do with Jesus. Thanks for the topic and the research. It looks like our family has some praying and searching to do on this one. For fun, check out the history of Valentines Day which comes from the most vile and discusting roots. Groundhog's day is also a most celebrated day of witchcraft. As you can see, it explains how all of this excess got started. Celebrating the birth of Christ can be done in anyway you'd like...it does not have to look like a secular Christmas. It's totally up to you. We are "downsizing" Christmas this year, and making it more about getting together, than about gifts. I'm excited too, because I think it will be great. This post provides good food for thought. I've never thought about whether or not God wants us to celebrate Christmas. I do know that He wants us to use each day to glorify and worship Him, though. Christmas, as do many of our holidays, has pagan roots. And sadly, Christ has been taken out of our celebrations and the giving has been changed to a mindset of getting instead. I know many people who do not celebrate Christmas with all the trees, lights and gifts but still celebrate and remember Christ's birth and His coming to earth. We have to remember not to leave the baby Jesus in the manger though but also remember the cross as a previous commenter stated. I personally enjoy giving gifts and some of the Christmas traditions. We keep it pretty simple though. It is so easy to blow out of proportion. Thanks for all the comments. I think that keeping things simple and reflecting on the gift of Christ is important. Ester, you are correct - we always have to remember the cross. Sharon, that video was awesome. I never knew any of that. Seems like Christians just took December 25th from the Romans out of convenience. It was neat to hear that Christmas ornaments started off as apples to remind Christians of Eden. Thanks for that link! Hey, I forgot about the apple thing. Back in our former church in MN, one tree in the front had apples on it, to remind us of our sin, and the other tree in the front had only white bulbs on it, to remind us of Jesus' purity, and our forgiveness from His death on the cross. Kinda neat, I thought. We always have an apple on our tree too. Thanks for the reminder! I enjoyed reading your thoughts on Christmas, because I have been thinking about Christian holidays lately. Here in Jerusalem we are in the midst of many holidays...the big "Eid"-- a feast for Muslims celebrating the end of Ramadan, Rosh Hoshanah--the new year for Jews, Yom Kippur in just a few days, and Shabbat dinner every Friday to usher in the Sabbath. A few days ago I remember someone remarking, "it seems everyone is always celebrating around here except the Christians!" I thought that was sad. As a people chosen and redeemed by God, we have the most reason to celebrate! In the Old Testament, God commanded his people to feast and celebrate all the time in order to remember what He had done for them...sometimes for whole weeks at a time! Celebration of all Jesus has done for us brings Him glory. Humbly giving up everything to come to earth in order to save us--the Christmas story-- is a huge part of his redeeming work in the world, and needs to be celebrated. The question is not IF, but HOW we celebrate. I think that is the real heart of the issue. i loved this post. it poses questions that we should be asking. i think it's important to celebrate jesus' birth, but leave it at that. at my house there is NO santa, NO st. nick. it's jesus. santa isn't real. st. nick WAS a real person, but we don't pretend that he still comes to our house. santa doesn't give gifts at christmas, mom and dad give gifts to celebrate jesus' birthday. as the girls get older i also want to have a birthday cake for jesus. to really show them it's all about jesus. the 'holidays' need to reflect him. that's also why we don't 'do' halloween (NOTHING about jesus in that AT ALL) the easter bunny, the tooth fairy, etc etc etc. none of that stuff is real. i find it very important to never ever lie to my kids, on purpose. you're true to say that no scripture says to celebrate christ's birth, but no scripture says to celebrate halloween and a lot of christians celebrate that obvious pagan holiday with no thought. i find that interesting. My father is a minister and I grew up in a Christian home all my life. When my mother was in Bible school, around the Christmas holiday, she was singing "Silver Bells" while it was playing on the radio when God spoke to her audibly and forcefully. He repeated the words, "It is an abomination to me." three times. She had no idea when God would say that to her, but she started to talk to some of her professors about it. Her professors disclosed to her that the pagan roots of Christmas were something they had wanted to teach about many times, but the board would never approve of it. December 25th was chosen as the date to celebrate Christ's birthday because it was a day that the Romans celebrated the birth of Mithras, the sun god. Followers of Christ felt that their God deserved a birthday celebration if even the pagan gods had them. Mithra's birthday is Dec. 25th because it is winter solstice, after which the days begin to grow longer... sunnier. "Don't take the godless nations as your models. Don't be impressed by their glamour and glitz, no matter how much they're impressed. The religion of these peoples is nothing but smoke. An idol is nothing but a tree chopped down, then shaped by a woodsman's ax. They trim it with tinsel and balls, use hammer and nails to keep it upright. It's like a scarecrow in a cabbage patch—can't talk! Dead wood that has to be carried—can't walk! Don't be impressed by such stuff. It's useless for either good or evil." The first followers of Christ never dreamed of celebrating His birth, because His death was much more important. Jesus actually commanded his disciples, "do not celebrate my birth, but celebrate my death." "They trim it with tinsel and balls"
Please do not change the verse to fit your ideas. Please everyone read your bible and let the Lord deal with each of you. I have a son that is almost three years old and we don't celebrate christmas. This is hard for people who know me because, I use to love christmas. It has taken 6 years to unhinged me from the lure and lust of this infectous holiday. The book of acts spans 30 to 38 years which gives us a history of what the apostles did. There is not the slightest hint of christmas, this should tell us something. The baby Jesus is not the savior but the man Christ Jesus is our savior and the one that died for our sins. Jesus birth and death while important would have no power if he was not raised from the dead. The power is in his resurection, we have power because he lives and he conquered death, hell, and the grave. Remembering a birth and a death are one thing, but it's interesting to me that people want to remember the tool that was used to murder Jesus. I know if my son was murdered with a gun, I wouldn't walk around with a gun on a necklace around my neck. I understand the cross represents the burden that Jesus carried for us, but again to me, the cross reminds me of him being killed and seems a bit idolatrous to me.